It's beginning to look a lot like Christmas, but where is the fresh, green Christmas tree? Oftentimes, we see them being sold in parking lots around the city, but did you know that many of those Christmas trees are grown right here in Montana? Many of the state's Christmas trees are grown on tree farms in Northwestern Montana, near Kalispell and Bigfork. In addition, Montana's pine and fir forests are home to many trees just the right size for your living room at Christmas-time. Tree farms in Montana raise a variety of Christmas trees, including pines, firs, and spruce trees. All of these trees grow differently and have different qualities. Two types of fir trees, Fraser and Balsam firs, are dark green, but the bottom of their needles are silver. 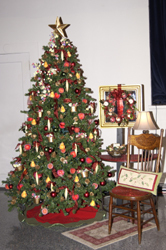 Christmas trees have been grown in the state for over 60 years. Montana Christmas trees are shipped all over the country, and have even been shipped foreign countries like Taiwan. So the next time you are out buying a Christmas tree, find out more about it. Was it raised on a farm or in the forest? What type of tree is it? And most important of all, does it have enough space to put all the presents you want for Christmas under it!? !